I have had a super busy weekend! The only reason I am writing now is because I am watching the rebuttal of the prosecution of the Casey Anthony case. I have been following it for the past 6 weeks. We had people over Saturday and Sunday. We were boating both days. Yesterday I tried wake boarding for the first time! I LOVED it! 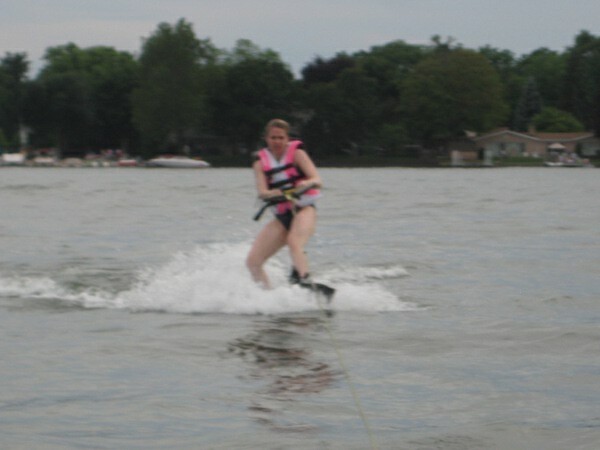 I have never even water skied but I wanted to try this. I was very nervous but I got up pretty easily. I was shaky, but even after a few times it seemed easier and easier. I cannot wait to try again next weekend. We spent a lot of time tubing and swimming as well. This morning was the 5k I signed up for. I actually had a boating accident yesterday. I fell from the tube when trying to get on the boat. I slipped and my chest and arm landed on the back of the boat. I bounced off and back into the water. I was unsure last night if I was going to go this morning. But when my alarm went off at 5:45am I decided I would be angry at myself if I skipped it, so I went. I did it in 30:56! Not too bad considering my accident and how sore I am from all the activity in general. AND for having a baby 5 months ago exactly. On that note I lost a bit more weight. 128.8! wooo hoooo! Slowly but surely I am getting back there. Today we head a couple hours away for a family party! Then tomorrow it is back to reality.